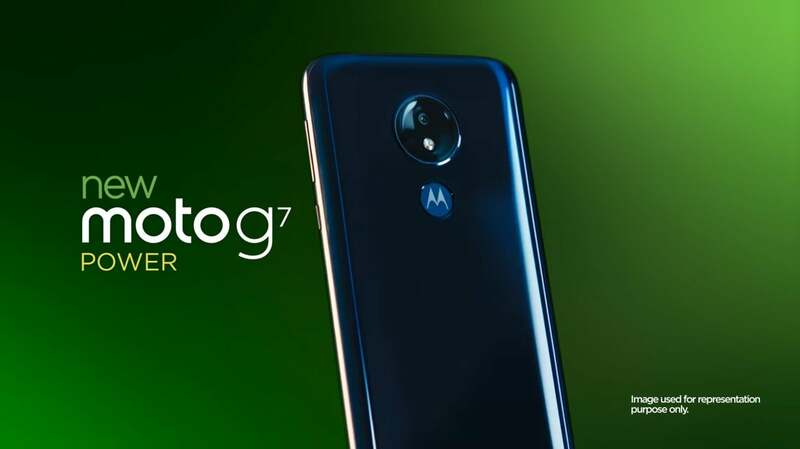 Lenovo-owned Motorola unveiled four new phones in the G7 family in February, with Moto G7 Plus being the highest-specced version. The device is now up for sale in China, and will soon find its way in other markets around the world. Meanwhile, HMD Global has launched its Nokia X71 in Taiwan and China. Both the Moto G7 Plus and Nokia X71 cater to the mid-range segment. If you are planning to buy a powerful yet budget-friendly phone but are torn between the two, this Moto G7 Plus vs Nokia X71 comparison should help you make an informed decision. It’s the first time HMD Global has launched a Nokia X-series device outside China. The device is expected to launch in markets outside China and Taiwan in the coming weeks under a different branding. It could be called Nokia 6.2 or Nokia 8.1 Plus in global markets. Both the smartphones have a sturdy design. The Moto G7 Plus has a waterdrop notch to accommodate the selfie camera, though the notch is bigger than the waterdrop notch you’d see on mid-range devices from Samsung, Huawei, and even Nokia. The phone measures 157 x 75.3 x 8.3 mm and weighs 176g. The front and rear panels are supported by an aluminum frame in the middle. On the back panel, the Moto G7 Plus sports a dual camera setup and a fingerprint reader for authentication and security. The device retains the 3.5mm headphone jack. Motorola has launched it in Viva Red and Deep Indigo color options. The phone has a noticeable chin at the bottom. The Nokia X71 also has a premium glass and metal design. It is the first Nokia-branded phone to feature a punch-hole display similar to Samsung’s Galaxy S10. The punch hole is placed in the top-left corner of the screen to accommodate the selfie camera. It measures 157.2 x 76.5 x 8 mm and weighs 180g. It retains the 3.5mm audio jack. On the back panel, it features a vertically aligned triple camera system and a traditional fingerprint reader. HMD Global offers Nokia X71 only in Space Black color with copper accents around the frame. The Moto G7 Plus sports a 6.2-inch IPS LCD screen with 1080 x 2270 pixels resolution. The display is protected by Corning’s Gorilla Glass 3. The waterdrop notch could bother some people because of its size until they get used to it. The phone has an 81.4% screen-to-body ratio, 19:9 aspect ratio, and 405pppi of pixel density. The Nokia X71 has a 6.39-inch ‘PureDisplay’ with Full HD+ resolution of 1080 x 2316 pixels. It has an impressive 93% screen-to-body ratio and 19.3:9 aspect ratio. The screen delivers crisp colors and high contrast. It also supports HDR10 playback for immersive video experience. The Moto G7 Plus runs Qualcomm’s mid-range Snapdragon 636 processor with Adreno 509 GPU. The processor is paired with 4GB or 6GB RAM and 128GB of internal storage. The phone also supports external memory of up to 512GB via a microSD card slot. It offers dual SIM functionality. The G7 Plus packs a decent 3,000mAh battery with 27W fast charging support. The battery is large enough to last a full day of normal usage. In terms of software, it runs Android 9 Pie out of the box. Most mid-range phones aren’t known for receiving timely software updates. But Motorola has promised to provide one major update and timely monthly security patches to the G7 series. On the other hand, the Nokia X71 runs a slightly more powerful Qualcomm Snapdragon 660 processor. It packs Adreno 512 graphics processor, 6GB RAM and 64GB or 128GB of internal storage. The device supports external storage of up to 256GB. It also offers dual-SIM functionality. The Nokia X71 packs a larger 3,500mAh battery with 18W fast charging. It runs the stock version of Android 9 Pie. There is no bloatware. You can expect timely software updates and security patches on the Nokia X71. The Moto G7 Plus sports a dual camera setup on the back. It consists of a 16MP primary lens with an f/1.7 aperture and a 5MP secondary depth sensor with an f/2.2 aperture. It supports HDR, panorama, and dual LED flash. On the front, the phone gets a 12MP lens for selfies. The Nokia X71 features Carl Zeiss-branded triple camera setup on the back. It includes a 48-megapixel primary lens with an f/1.8 aperture, an 8MP ultra wide-angle lens, and a 5MP depth sensor with an f/2.4 aperture. You can expect crisp and detailed pictures. The Nokia X71 also takes good pictures in low-light conditions. On the front, it features a 16-megapixel selfie camera with an f/2.0 aperture. Motorola has revealed the Moto G7 Plus pricing in China. It costs 2,099 Yuan for the 4GB+128GB variant. The high-end variant with 6GB RAM and 128GB storage retails for 2,399 Yuan in the country. 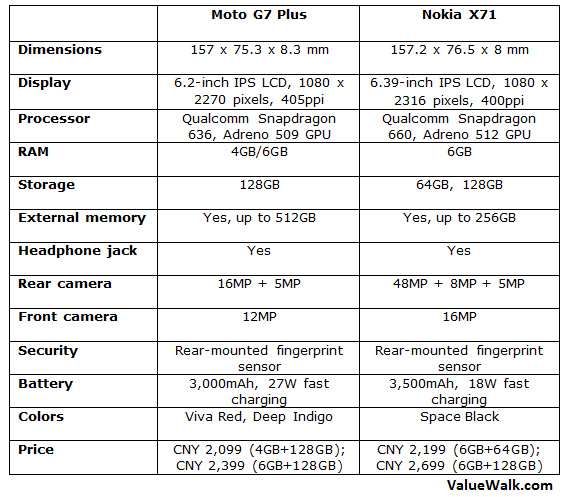 In contrast, the Nokia X71 is selling for 2,199 Yuan for the 6GB+64GB model. If you want the 6GB+128GB variant, you will have to shell out 2,699 Yuan. The device will soon be released in international markets under a different branding.